Grounded growing problem of money supply and money demand and solvency of individual governments and parts of the population in Eastern, Central and Southern Europe. Imbalance in production of real products and consumer demands are forcing governments of these countries to increase the money supply for increasing nominal incomes and budgets, causing inflation. 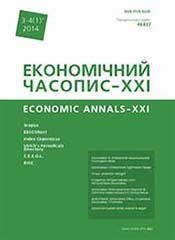 The views of economists on stabilization, balance and convergent development of the economies of the individual countries are divided and defined two main positions: first, to increase aggregate demand through the growth of the money supply in circulation for recovery of consumption and investment in the economy, and secondly, to regulate the money supply, ie aggregate demand , in order to restrain inflation and holding the market in a state of relative equilibrium. Жовтанецький В. І. Політика інвестицій і зайнятості в системі конвергентного розвитку економіки регіону / В. І. Жовтанецький, Б. Ф. Заблоцький // Регіональна економіка. – 2013. – №3(69). – С. 66-72.